What do you like to watch? Sports? Movies? Do you like playing video games? How far will you be sitting from your TV. What is your room lighting situation? Are your room’s furnishings and layout compatible with your intended TV screen size? Knowing the answers to these questions will help make your purchasing decision that much easier. When considering the TV size be sure it will fit into the intended space in your home. I personally like to have a measuring tape on hand to measure the actual dimensions of the TV before I purchase it, and also to measure the stand and/or wall area in my home where the TV will be placed. You must also consider your viewing distance from your TV when choosing a screen size. You don’t want your screen to be so small to the point to where you have trouble seeing the image clearly from across the room. Nor do you want it so large that it overwhelms you while viewing or if you have trouble following the action on screen. Use the chart below to help determine your viewing distance range. Note that the chart provides a viewing range for each screen size. Note: Screen sizes are always measured diagonally. In my opinion the bigger the screen size the better. So I recommend getting the biggest screen that fits your budget and room. 720p, 1080p and 2160p (4K) are the current HDTV screen resolutions available. These numbers refer to the number of pixels on screen, and the more pixels a TV has the better picture detail it will show. 1080p has twice as many pixels as 720p. 2160p or 4K has four times as many pixels has 1080p. So what resolution should you choose? If you will be viewing a lot of broadcast programming (cable, satellite, over-the-air HD) 720p will do just fine if you’re not looking to spend a lot of cash and just want a basic entry level HDTV, and these displays will deliver great image quality. One thing to note is that most broadcast programming is delivered in 1080i (“i” is for interlaced). A 720p TV will convert that signal to 720p. Choose 1080p if you want to view a full HD image. If you plan on viewing Blu-ray disc you most definitely want a 1080p HDTV, because most Blu-ray movies are mastered in 1080p/24, and you will want to view these films in their native resolution for the best picture quality. You will also need a Blu-ray player capable of processing a 1080p/24 signal. Steaming services such as Netflix provide content in 1080p which will require a 1080p capable set. Also, many video games on Xbox One and PS4 are being produced in 1080p. 1080p vs. 720p – picture quality. Generally speaking, if you sit more than 8 to 10 feet away from your HDTV, and your display isn’t larger than 50 inches, you won’t be able to tell the difference between 1080p and 720p. I personally recommend going with 1080p over a 720p. This way you will be ready to view all available content that full HD has to offer. 4K (2160p) is the latest screen resolution to hit the market. Technically it produces four times the resolution as 1080p. To benefit from this technology, you will need to sit much closer to the screen in relation to a 1080p image at the same viewing distance and screen size. 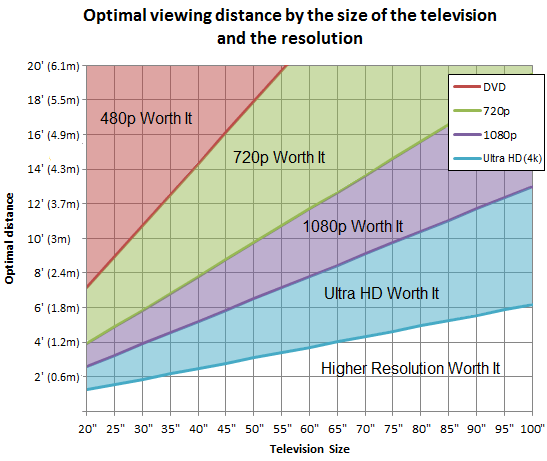 For example, and according to the chart below, on a screen size of 65″ the optimal viewing range for a 1080p image is from about 8 to 13ft. Viewing a 4K image on a 65″ screen has an optimal viewing range of 4 to 8ft. So to appreciate the benefits of 4K you will need to sit approximately twice as close to the screen. LED, LCD, plasma and OLED. Which technology should you choose? LED and LCD both produce a sharp, detailed and bright image that is ideal for brightly lit rooms. However, LED has the edge in over-all picture quality due to the LED’s that are used for the back-lighting of the display panel vs. the fluorescent lighting used in an LCD display panel. Plasma displays produce images with superior contrast and black levels when compared to most LED and LCD displays. Plasmas produce images with deep blacks, rich contrast and accurate colors. However the images are not as bright as LED and LCDs. One other thing to consider if choosing a plasma, is that they will be less available since Panasonic has decided to exit the plasma market. Update Note: Plasma TVs are no longer available. OLED is the latest display technology to hit the market and produces an image that is the best of both LED and plasma technologies. The picture quality has been regarded as the best-ever seen of any display technology. And in my opinion and experience, these statements hold true. In addition to 4K resolution, that I mentioned above, you should also be aware of a new technology called HDR or High Dynamic Range which is now available on many 4K LED and OLED technology based TVs. HDR TVs when displaying the proper source content can deliver much better picture images than non-HDR models. High Dynamic Range provides increased contrast with a greater range of peak brightness (highlights) and black levels, in addition to better picture detail and more vibrant colors, which all add up to better overall picture quality. For much more info on display technologies please see the article: HDTV Technology. Let’s talk refresh rates….the numbers…. 60Hz, 120Hz and 240Hz….what do they mean? How do they it impact picture quality? So let’s get right to the numbers: 60Hz, 120Hz and 240Hz all relate to how many times a second a displays image is regenerated or refreshed. Or, in other words how many times the TV image changes. These numbers also refer to the amount of frames per second (fps) in a TV image. Refreshing the TV image helps reduce an artifact known as motion blur. Motion blur is not a problem with plasma TVs due to how the work. But, LED-LCD TVs due suffer from motion blur. However, everyone doesn’t notice or see motion blur the same. It all depends on how your eyes and brain handle the image. To give you an example of what motion blur is, imagine a football being thrown through the air, and when viewed on a TV with a refresh rate of only 60Hz, you might notice motion blur( the football will look blurred or somewhat out of focus). Now let’s take that same image and display it on a TV with a 120Hz refresh rate, and the motion blur will be reduced or completely eliminated due to the TV creating more frames per second to keep up with the motion on screen. So when viewing fast motion content such as sporting events, 120Hz refresh rates can be a benefit . There are down sides to using the motion blur feature on HDTVs: When viewing an LED-LCD TV with refresh rates of 120Hz and 240Hz, they can suffer from what is known as the “soap opera” effect. This can cause film based (movie) images to look ultra-smooth and unnatural, and will ultimately make movies look like video such as seen in a soap opera TV show. Motion blur may only be a problem when viewing images with fast motion such as sporting events and movies which are shot at 24fps. The good news is the motion blur feature can be turned off if you don’t like the effect it has on your picture quality by going into your TV’s menu. The name of this feature will vary among manufactures. Here is a short list: LG-TruMotion, Samsung-Auto Motion Plus, Sharp-Aquo Motion, Sony-MotionFlow, Toshiba-ClearFrame or ClearScan and Vizio-Smooth Motion. Personally, I find the step from 60Hz to 120Hz refresh rates worth it. The step from 120Hz to 240Hz may have a modest improvement or none at all reducing motion blur, and is not worth the extra money, in my opinion. Furthermore, any TV that claims a 240Hz refresh rate is not creating a (true) native refresh rate. It is actually referred to as an “effective” refresh rate, which means the TV is using a technique called backlight scanning to create the extra frames needed that make up a 240Hz refresh rate. 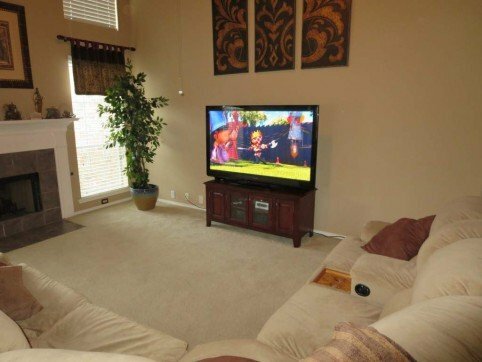 This area can be commonly over-looked when seeking out an HDTV. 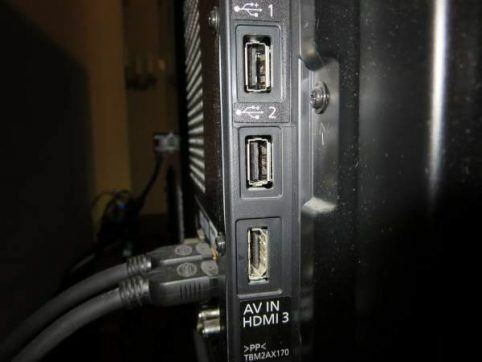 You should at least have a minimum of 3 to 4 HDMI ports. I personally prefer no less than four. These will be used to connect other devices such as blu-ray and DVD players, cable and satellite set-top boxes, sound bars and gaming consoles. So be sure to take inventory of all your devices that will be connected to your TVs HDMI ports. You also want to consider any USB devices that will be connected to your TV such as digital cameras, cell phones and other media devices. You will also need an Ethernet port if you choose to hard wire your TV to your homes computer network. All 4K TVs should have HDMI 2.0 compliant inputs. This type of input is required to pass 4K video content. In addition, HDMI 2.0a inputs are required on all 4K TVs to pass HDR video sources from blu-ray disc that contain HDR content. However, 4K HDR video from streaming sources such as Netflix and Amazon Video do not require an HDMI 2.0a input because they skip the HDMI connection entirely and connect to your TV using the internet which, allows direct communication between the internet and the TV’s decoder. HDCP 2.2 copy protected compliant HDMI inputs are required to view copy protected 4K Ultra HD content on 4K TVs. You should also consider a TV with an HDMI ARC (Audio Return Channel) input. In theory, ARC is supposed to let you have one connection between your TV and whatever you use to create sound: a receiver or a sound bar. You send video to the TV with an HDMI cable, and that same HDMI cable sends audio from the TV back down the same cable. If you have a device that requires RCA connections that pass audio and video signals to your display, you will want a TV that has these type of inputs. RCA connections however, are becoming rarer these days due to HDMI ports. If necessary, you can purchase an RCA-to-HDMI adapter to complete this connection. In home 3D viewing to date has not been all that successful. And in my opinion, the reasons for this are due to a lack of consumer interest and available 3D content which is limited to a small number of sources along with the necessity of having to wear 3D glasses and having to purchase a 3D Blu-ray player. This has definitely hurt the wide spread adoption of this format. I personally have a 3D HDTV in my home with a limited number of 3D Blu-ray discs. I do enjoy the” in-home” 3D experience with results that are very similar to want can be seen in your local movie theater. I also view 3D content through Netflix. And in my opinion Blu-ray delivers better 3D picture quality than broadcast 3D programming such as Netflix and other broadcast sources I have viewed. But I must admit I rarely do any 3D viewing in my home. So is purchasing a 3D TV worth the extra expense? Well, most mid and all higher priced HDTVs are equipped with 3D as a standard feature. Which means you will likely end up with this feature whether you desire it or not. As the old saying goes… it’s better to have it and not need it than to need it and not have it. Today’s HDTVs have seen lots of technical advancements since hitting the market over fifteen years ago. One of those advancements is the advent of smart TVs. I personally think this is a really cool feature and can be enjoyed in many different ways…. 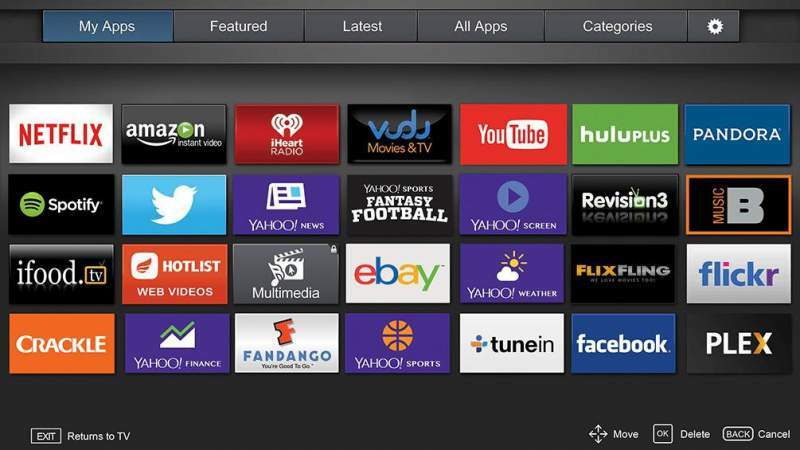 Smart TVs have apps just like you would on your smart phone. You can stream movies from services like Netflix, Vudu,Hulu and Amazon. There are apps for sporting events for all you sports fans out there, and apps for music listeners via Pandora and Spotify. Smart TVs also have built-in web browsers which allow you to connect to the internet and visit sites such as Facebook and YouTube right from you big screen HDTV! Connecting your smart HDTV to your homes computer network can be done via Ethernet cable or even more conveniently using its built-in Wi-Fi capabilities which will allow your TV to connect wirelessly to the internet. Once connected to your network, you can enjoy all of your TVs smart capabilites/functions. You can even view picture and video files you have stored on your computer. If you plan on purchasing online, I advise you to first go to the store to have a look at the HDTV you plan to buy or other similar models. If possible, try to check out different types of video (movies, sports ,broadcast TV and Blu-ray/DVD disc) to see how the TV performs with different types of source content. Don’t base your decision solely on the picture quality you see in the store. Remember, all TVs on the show room floor are usually set at the factory to make their pictures stand-out in order to attract the attention of consumers to their displays. These setting aren’t the best for viewing your TV in your home. Once you get your TV home, you can change the picture mode from the sets menus or calibrate it for a better picture. Click the highlighted link for my article on how to calibrate your display for best picture quality. Using this article as your guide should take most of the challenge out of buying an HDTV. And you now have the info you need to find the display that is the best fit for you and your home. Did you find this article useful? Are there any other areas within this topic you would like me to cover? Did you find this article to be helpful and informative? Please leave your thoughts and comments below. Great information. I’ve learned a lot I never knew. Especially the difference between LED, LCD and Plasma. Glad I didn’t buy that plasma lol. I’m glad you found the info at HDTVs and More to be useful and also a learning experience. Can you believe all this information in one spot. It never made a lot of sense looking at a bit of info here and there. I now have a note to look at to keep me current. Almost bought the wrong TV today. Thank you….. Thank you. This will save me days of trying to know what I want. ? Do you know much about cell phones. Glad you found the info in this post useful. Samsung Q90R and Q70R Comparison Review – Which one should you choose?